The story opens with Yang Mi, a mischievous princess of the fox tribe who has a tendency to get into more trouble than her family can handle. To give her a bit of responsibility, they send her off (disguised as a boy) to be trained by Mo Yuan, the God of War. Mo Yuan is the leader of the Kunlun Mountain sect and well versed in martial arts, but he develops a soft sport for his beloved 17th disciple. Then the worst happens as the ghost lord Qing Cang rises up in rebellion and tries to use the Dong Huang bell to destroy the world forever. Sacrificing his soul to stop the attack, Mo Yuan is knocked into a coma with only Yang Mi left to protect his body. Time passes. For 70,000 years Yang Mi carefully takes care of Mo Yuan and waits for him to return. Meanwhile: cold, harsh, unemotional Ye Hua, future emperor of Heaven, understands neither mercy nor love. Imagine his horror when he is injured on a trip to earth and must recuperate in the hands of an extremely clumsy human girl who thinks he’s a snake. Thus begins the tale of Yang Mi and Ye Hua, a tragic love story spanning three lifetimes woven in amongst betrayal, treason, heartache, joy, and always fighting against the powerful creature called fate. Can they (and those around them) not only learn what it means to love and to forgive, but also find the fates destiny has for them? MUSIC: The music is simply gorgeous. So beautiful in fact that I actually bought the soundtrack for it. I’ve put the OST (main theme song) belong, so you get listen to that yourself. But I just really thought it was lovely, and I listen to the song ALL the time when I’m working or studying. Unlike some dramas, this song was actually written for the drama and really fits with the lyrics. Really though, all the music was great – grandiose when it needed to be grandiose, bright and fluffy appropriately, etc. VERY Well done! SPECIAL EFFECTS: Once again, I know several reviewers and commentors said the special effects for the drama were not good. Maybe I’m just easy to please, but I thought they were great. I have a passion for Fantasy dramas, and I’ve watched as many as I possibly can. Perhaps there are spots here and there where you can spot the CGI or effects, but on the whole — this drama nailed it. I did of course get so caught up in the plot that I may have just been oblivious, but I’ve rewatched several of my favorite parts of the drama about 13 times so far and I still think it was solid effects. Beautiful colors, gorgeous costumes, great make-up, stunning architecture — that peach tree orchard begs me to go visit. I’m definitely getting my future husband to make me an orchard. CHARACTERS / ACTING: The acting was simply brilliant! I can’t really name a single character that I thought didn’t hold up their part. Mark Chou as Ye Hua was just fabulous — you really felt the emotionless aspect at the beginning as well as his confusion at the lengths people would go to for this “love thing.” But then later, when he is crying over Su Su, it’s just heartbreaking. His little shocks when he first meets her and then his bravery and sacrifices later in her name – you just wanted to give him a huge hug and tell him everything would be okay. Seriously, the dude ripped out your heart. And the adorable little boy – he’s just SO CUTE! OMG he is the sweetest little kid ever. I love his “little dumpling” title – fits him to a tee. And his interactions with both Ye Hua and Su Su were so precious. I could keep going – I won’t because this would be too long – but the acting was definitely fab. LENGTH: This drama is long, and I would definitely divide it into three parts plot wise. Unlike some dramas though, I don’t think there was really an episode you could skip and still move forward. Part of the reason for its length is that it had a TON of plot lines running at the same time. You had about 4-5 different couples, plus the whole “saving the world” theme, the Mo Yuan plot, the Ghost world plot. . . . you get my point. It was just a whole lot going on in one story. But I’ve got to say, I watched it all. Usually I’m pretty quick to skip over boring fighting or “plotting” parts that seem to take up so much of the Chinese drama time. But here, I just soaked it all in. And I actually enjoyed all of the plot lines. PLOT: Just so good! It was complex, it was convoluted, it was chock full of emotions and action and movement. There were a million things interacting and impacting one another – the romance of once couple subtly igniting events that struck another which triggered reactions flowing on to a third. You felt the romances and tragedies alike. Even when you really hated Su Jin and the Ghost Prince, you could also feel their pain and heartache at the same time. Everyone had their reasons and passions – it was just a story of how you should respond to them. FINAL THOUGHTS: This drama isn’t something to watch if you’re looking for light and fluffy or sweet and cheerful. Although it has a happy ending for some, it isn’t so happy for everyone. Kind of like life, the drama has its ups and downs. It pulls you along for an emotional roller coaster and you really do get involved. If you don’t have time to watch all the episodes, then hold off. 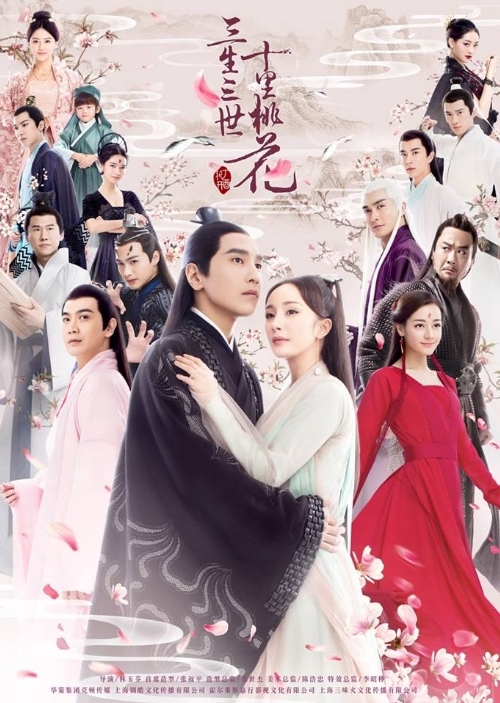 But if you really like Chinese dramas and want something to sink your teeth into, this is a great romance / fantasy show! *There is some issue here over the original book this is based on. A long time ago, an author wrote a Boy Love (Gay) novel online that told the story of Ten Miles of Peach Tree Blossoms. Then a different author – Tang Qi – found it and “adapted” the novel into a Hetero story. Many people who have seen both claim that what Tang Qi did was out and out copyright infringement / theft of the original novel. They argue that it is often same word-for-word and character names, everything. Just with a boy and girl instead of boy – boy. I’ve personally never read the original BL novel, although I did read and enjoy Tang Qi’s adaptation. I cannot tell you whether it was copied or not – just be aware of the debate around this. So far the original author has not made any legal claims – although it might be a little difficult given the Chinese Government’s feelings about homosexuality. ← When the Earth Mourns ~ Where is the #Justice?